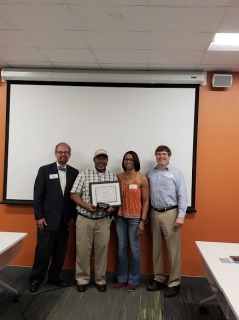 Ben Boyd, Help Desk Manager for Methodist Le Bonheur Healthcare, completed his Lean Six Sigma Project to receive his Lean Six Sigma Black Belt certification on May 21, 2018. Ben’s project entitled “Workstation Procurement Fulfillment Process Improvement via Lean Six Sigma” was launched in November of 2017. The project met its goal of reducing the average fulfillment time for new standard computer requests in the MLH organization from its 15- business day average to 7 business days by March 31, 2018. This represents a reduction of 54% in fulfillment time. The project followed the Lean Six Sigma DMAIC methodology, which involves clearly defining the issue, or business problem, measuring the current stat e of the existing business processes, analyzing the factors that contribute to the excessive computer delivery times, in order to determine the key, statistically relevant or critical factors.